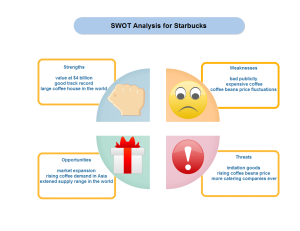 Creating SWOT analysis with free templates and examples. SWOT analysis has never been easier. 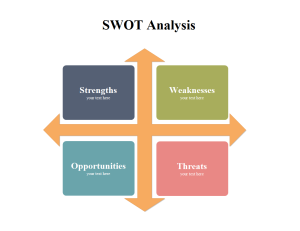 SWOT analysis is a structured planning method used to understand your strengths and weaknesses, and to identify both the opportunities open to you and the threats you face. The method is credited by Albert Humphrey, who used data from Fortune 500 companies. Edraw SWOT analysis aims to help an organization match its resources to the competitive environment in which it operates. For individuals, Edraw helps you develop your career in a way that takes best advantage of your talents, abilities and opportunities. 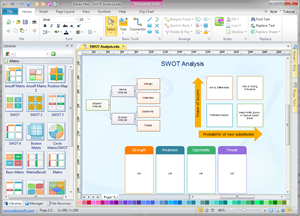 You can use Edraw to create SWOT analysis diagrams quickly and easily. It has a large collection of pre-drawn shapes and many advanced functions, which greatly reduces the complexity of drawing. You can simply drag and drop the pre-made shapes, while hand-draw is available as well if you want. There are professional built-in themes for you to apply by a single click, or you can customize your drawing through the rich color scheme and fill options. A nice-looking and professional SWOT analysis could be finished in just minutes. Once you're done, the diagram could be printed or exported to PDF or other graphic formats. Learn an easy way to create SWOT analysis matrix. A finely designed SWOT analysis template is readily available, through which users can create nice SWOT diagrams with the least effort. 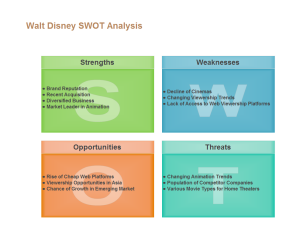 A customizable Disney SWOT analysis template is prepared for users to learn and apply. Click the picture to have a full view of the example and download it for your own use. 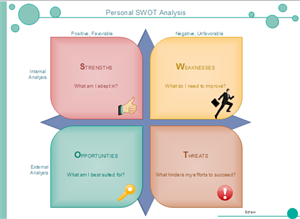 Use this SWOT analysis example to analyze yourself, including both favorable and unfavorable factors. Download it for free. Double click the shapes to replace the texts with your own contents. 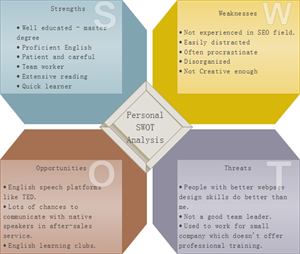 This is a detailed 3D personal SWOT analysis example. Click the picture to download it as a reference.